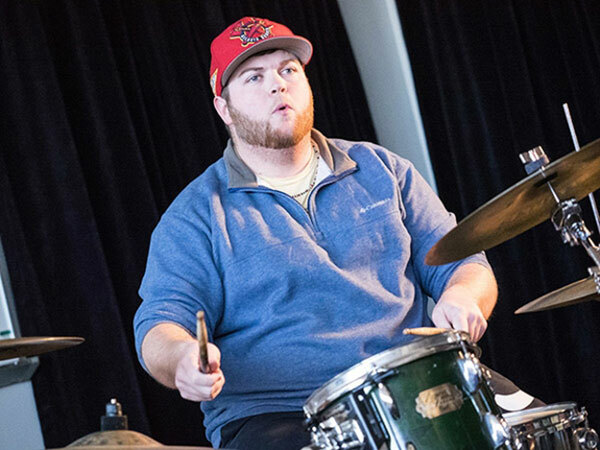 Luke Ross, one of MGA's first students to pursue the new Bachelor of Arts in Contemporary Musicianship, is already an accomplished percussionist. Full Name: Jonathan “Luke” Ross. High School: "Peach County High School, where I was part of the Trojan marching band for four years as a percussionist. I was a section leader in the band for three years. Also, I was a varsity golfer for four years." Family: "My parents, Dennis Ross and Pamela Ross, have been my biggest supporters and they put up with me beating around on drums and making music for many years now." Employment: "I am the percussion instructor alongside Miguel Castro at Northside High School in Warner Robins. Miguel and I have worked as a team to produce superior rated percussionists two years in a row. I also work as a drum instructor at The Rhythm Factory in Warner Robins. Also, I have now been a part of three theatre productions at Theatre Macon as a percussionist. (Peter and the Star catcher, Matilda, and Mary Poppins) I also play drums weekly for Lawrence Drive Baptist Church. Lastly, I play drums/percussion for my travelling band, Company of Crows." Degree Objective: Bachelor of Arts in Contemporary Musicianship. Activities: "I am part of the Middle Georgia State University Band of Knights, Jazz Knights, and percussion ensemble. I am the percussion section leader for these groups and also the production manager." Career Goals: "After I graduate from Middle Georgia State, I plan on attending Middle Tennessee State to pursue a master’s degree in percussion performance. I would also like to be certified as a teacher. With these two degrees I would like to audition and be able to be rewarded a spot in a symphony and teach music when I’m not performing." He chose Middle Georgia State University because … "The music audition with Miguel Castro and Dr. Alan Clark made me feel welcome immediately. Also, college expense was a factor. Not only was the tuition affordable but the University is close to home." The greatest thing he discovered about Middle Georgia State was … "How willing most of the professors are willing to help you do well in their classes in every way they can. They push me to be successful. I am being challenged by music in a different way and I made a promise that I will not give up. Failure is not an option." His greatest academic experience as a Middle Georgia State student has been … "Having the Band of Knights perform my music at a highly acclaimed band competition, The Heart of Georgia, this year." To him, greatness means … "Striving to be the best you can be by waking up every morning and being relentless about what you do and how you can be better than you were yesterday. Greatness is going through life and not trying to measure up to anyone else or reach for the success 'bar' but instead being the 'bar' and helping everyone possible to be successful in their own lives." In five years … "I will be teaching music and performing every chance I get."